More than half way through the One Room Challenge and our basement overhaul is coming along nicely. This week we paint the cabinets. The One Room Challenge™ HERE is a widely anticipated biannual event every April and October. Each round, twenty design bloggers take the challenge and transform a space. Every Wednesday, the designers document their process while sharing their sources and professional advice over six weekly posts. Definitely check out their posts to see incredible design transformations! If you are joining Happy Haute Home for the first time, welcome! I am happy to have you join me on my design journey as I transform each area of our home. You can catch up on my guest participation in the One Room Challenge, along with the before pictures, and project details from prior weeks below. We had a very busy week of cabinet painting. My painters have been working long days in an effort to complete the job on time. 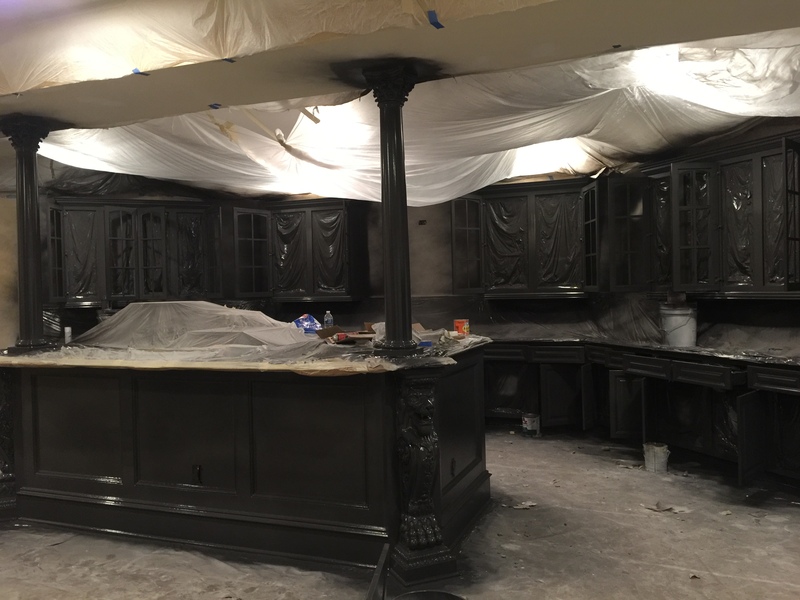 They have sanded, primed, and sprayed two coats of paint on the cabinets and the island. This is a big project and a lot of painting in a short time so the area has a strong odor. Luckily the space is in our basement and we can close the door leading to the upstairs. The paint will take a couple weeks to fully cure so we will have to be careful when we install the hardware and glass shelving. The paint is still wet in these pictures, I expect the color and texture to appear more satin when dry. The paint we are using for the cabinets is Benjamin Moore HERE. It is by far the best cabinet paint we have found available on the market for wood and cabinets. Definitely check your local Benjamin Moore store to get the best price for the paint. The color we chose for the project is Obsidian, very deep gray/light black – color is from Restoration Hardware. As I mentioned above, the best paint we have found to use on wood is Benjamin Moore HERE. In addition to the cabinets, we used it on our fireplace surround wood mantel. The paint goes on evenly and smoothly. It’s incredible how good it looks in all the detail of the mantel surround..not clumpy at all. I also believe spraying instead of using a brush allows for a more even application…as long as you are experienced with the sprayer. The color is a very big change from the brown cabinets, don’t you think? So far, we are very happy with the space transformation. My next decision is to choose the paint color for the interior cabinets. I have been a bit indecisive in this area, trying a couple different colors. Check back next week to see the final decision. Previous Post Cherry Blossom Branches – Washington D.C.
Wow, this is going to look great! While I hate the process of painting, I always love the final look-it can make such a big difference. Looking forward to seeing your final ORC transformation! Thank you! I hate the process as well…and even more when I choose the wrong color! But I think I got it right this time..thanks for following along. Yes, went with a darker look for the bar area..looking really good and coming together 🙂 Thanks for visiting Lynn! Can’t wait to see the final look! Thanks! It’s coming along nicely..very happy so far!